Hag's End is a small Nordic ruin with a few magic users present (witches, hags, and hagravens). Hag's End is found within the Deepwood Vale outdoor area. It is only accessible via Deepwood Redoubt and can only be left that same way. Deepwood Redoubt is found in the mountains west of Dragon Bridge, slightly southwest of the barrow Volskygge. Once inside, a hagraven leader will engage you in combat and she will teleport to different rooms as you deal damage to her and kill her minions. Upon entering, to your right is a lit brazier atop a stand and to your left is a sideboard with a shelf. On the sideboard is bone meal and a horker tusk. Opposite you is a stone table with a cup on it. The corridor ends at an unlocked iron door on the left. Through the door is a dining hall, where you will encounter the hagraven leader and two witches. Once you initiate the fight, a third witch will run into the room from the room on the left. After you have dealt some damage to the hagraven, she will teleport to a room on the third floor. In the dining room is a very long table with a total of eleven chairs along the sides. On the table is a sabre cat snow pelt, a sabre cat pelt, two hagraven feathers, a stone bowl that contains a hagraven claw, and two wooden plates, one with a charred skeever hide, and one with a baked potato. On your left is a wooden door to what looks like a bedroom. To the right of the door is a sideboard and, on the floor, a stone bowl which contains a horker tusk. On the sideboard is a mammoth tusk, a horker tusk, and a sliced goat cheese. To the right of the sideboard is a cupboard with nothing of interest. At the far end of the room is another wooden door with a path heading northeast. In the middle of the southeast wall is a fireplace with a cooking pot in front of it. On your right as you first enter the room is a stone bench and to the left three barrels and three sacks all stacked up. As you enter the bedroom, on your left there is a stone table with an alchemy lab inset. To the left is a potion of plentiful magicka and to the right a bowl of bone meal. There are five single beds in the room, between the second and third from the left is horse hide on a piece of rubble and between the third and fourth is a random pair of boots. There is an end table to the left of the fifth bed. Between the fifth bed and the door is a sideboard, on the sideboard is some mage robes and a random potion of healing. In the middle of the room is a double sideboard with a lit brazier on top. Around the brazier is a scroll of Firebolt, a pair of random gauntlets and an iron dagger. Through the door to the northeast is a short corridor with a flight of stairs up on your right-hand side. Ahead is a room with snow in, be careful as there are also three frost runes on the floor, one ahead and one to either side. 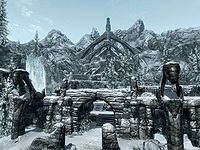 At the rear of the room is a set of studded Imperial armor on a broken table with a burial urn just in front of it against the wall and in the snow at the back of the room is a bowl. Against the north wall is a broken sideboard with a mead barrel, a bowl and a burial urn on top, with a rabbit hanging from a rack above. 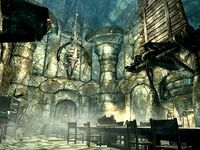 To the left as you enter the room is a bookcase containing a hunting bow and two potions of minor healing. There is a large urn to the right of the bookcase. There are a set of shelves, two barrels and a small set of shelves on the right as you enter, but them hold nothing of interest, except a bowl on the larger set of shelves. Be careful when removing the runes as they will blow everything around the room. At the top of the flight of stairs is a pressure plate activating a battering ram from your left. To the left is a stand holding an empty random soul gem. In front of you is a sideboard with a statue above it and on it two burial urns and an apprentice trapped chest which activates a poison dart trap fired from the statue in front of you. The path continues to the southwest up a few steps to an unlocked wooden door. Opening the door will reveal the hagraven sitting on her throne with two witches sitting facing her on either side. Again once you have dealt enough damage, the hagraven will teleport to a higher level. Initiating the fight will alert others to your presence, however they can not get into the room until you drop a wooden bridge, that is on your right as you enter the room, with the lever to the right of the bridge. On your left as you enter is a stone table with a copy of the Illusion skill book Mystery of Talara, Part 4. There are four benches at an angle in front of the throne. Against the southeast wall are two sideboards on top of each other with a random potion of healing on top. Behind the throne is a hidden room in which you can find the Assassin of Old. The switch used to enter this hidden room is right behind the throne but it will not appear until you have started the associated quest. As you cross the wooden bridge, be careful not to alert a hag that is just out of sight to the left of the corridor ahead. On the other side of the bridge the corridor climbs a few steps and then there is an iron door on your left with a lit brazier opposite. In this room will be a hag, unless you have already dealt with it. A large frostbite spider will also descend from above in the center of the room and attack as soon as you enter the room. There is a stone bench on either side of you as you enter with two bookcases along the southeast wall. The first has nothing of interest, but the second has a horse hide, a random helmet and on top an ice wolf pelt. To the right is a throne and further around the room a fireplace. On a mantle to the right of the fire, you will find the Hag's End key. There is a copy of The Legend of Red Eagle and a random poison on a sideboard against the west wall and at least seven hagraven feathers in the straw in the center of the room. Back in the corridor and continuing to the northwest, past a stone table and climbing a few more stairs you come to a junction to your left is a master-locked gate that will unlock with the Hag's End key and on your right a dropped gate with a handle on the left of it. Through the locked gate, past a statue on either side is an unlocked, but expert-trapped chest with a coin purse to the right hiding the tension cable trapping the chest, and to the left a steel shield. 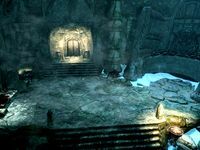 There are also dead draugr in alcoves either side of the chest that can be looted. The trap on the chest activates flamethrowers from the statues and from a third in the ceiling. Back in the corridor and pull the handle to open the gate. Wait a few seconds before moving forward as this will also activate spear traps from either side, there are a series of three gate that open one after the other a few seconds apart with more spear traps between each gate. At the top of the stairs you enter a room with the hagraven, a witch and a hag. Like before dealing enough damage to the hagraven will cause it to teleport further up the ruin. After dealing with the other two you can explore the room. Things may get blown around this room during the fight, but there is a filled random soul gem and empty petty soul gem on your right as you enter, among some rubble. There is a master-locked iron door on the left against the northwest wall. There are two burial urn, one either side of a raised area with a plinth on that has a copy of the Spell Tome: Flames and also an urn on the near side beside the burial urn. There are many candles lit on the floor arranged in circles around the room. Opposite the iron door is a path blocked by a lowered gate. In the southern corner of the room is a small alcove, blocked by a master-locked gate and to the right an empty petty soul gem and beside this a stone bowl with a second filled random soul gem inside. Behind the iron door is a small area with a burial urn, a random battleaxe, a plate, a random helmet and a potion of minor healing. There is also an oil lantern at the top of the pillar that can be shot down to set fire to the oil slick in the large circle in the middle of the room. Finally on the pillar is a chain that activates the closed gate on the southeast wall. Activating the chain will open the closed gate to the southeast and also a second gate at the far end of the pathway. This path has alcoves for the dead on either side, but no draugr, only a burial urn in an alcove on the right. At the top you enter a room with the word wall off to the right, stairs in front of you, with an iron door opposite leading back outside and a stone table on the left, covered in blood and decapitated skeevers. In the eastern corner is an arcane enchanter. In the western corner is a burial urn that has nearly been completely buried in snow. The word wall teaches you part of the Slow Time shout. There is nothing else of interest in this large room. Exiting through the iron door opposite brings you out onto a balcony above Deepwood Vale and the final showdown with the hagraven. 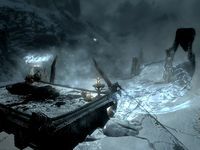 As soon as you exit the hagraven will summon two frostbite spiders or ice wraiths, depending on your level, but they will not disappear when the hagraven dies and must be dealt with separately. Once they are all dealt with, there is a stone table in the middle of the balcony with a dead witch laid out on top, beside her is a unique weapon called Bloodthorn, a steel dagger with a three second soul trap enchantment. There are also three hagraven feathers and a sample of juniper berries on the table. To the northern end of the balcony is the boss leveled chest for this location. Once you've dispensed with everything, work your way over to the waterfall (on the right, facing out to the vale) using mountain climbing or one word of Whirlwind Sprint. There is an expert-locked chest with decent loot and a pair of unique boots, Predator's Grace, next to the chest. Note the quicksilver ore vein nearby. Do not re-enter the trapped corridor straight after pulling the chain in the room with the oil slick, as you are at risk of getting caught between the lowering gates. There is no way to open these gates from between them and the only way out is to reload a previous save. After getting the first word of the Slow Time shout from elsewhere, the word wall may not work properly. The wall's sound effects can be heard but no word is learned when the wall is approached. You can use the console command player.teachword 48ACB to learn the second word (or 48ACC for the third word). The oil slick doesn't appear. ? 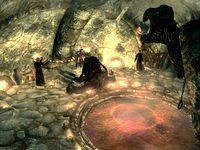 If you soul trap the hagraven before the final encounter with the Black Star empty, the hagraven will teleport away and you will permanently lose the Black Star. ? If you manage to kill the hagraven in the first room, there is a chance she will not appear at the end of the dungeon, though you can hear her teleporting ahead. ?